Have you had panang curry yet? 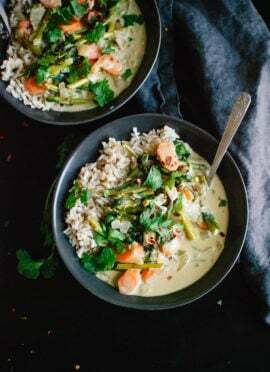 Panang curry is a rich and creamy, spicy yet balanced, peanutty coconut sauce. 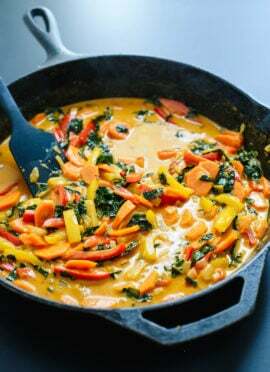 I make my panang curry with lots of bell peppers and carrots, and optional tofu for extra protein. It’s a perfectly satisfying weeknight meal for cold days. Panang is one of my favorite Thai curries, right up there with red curry and green curry. If you haven’t ordered it at your favorite Thai restaurant yet, you’ve been missing out! When it comes to Thai curries, the curry paste represents a big portion of the final flavor. 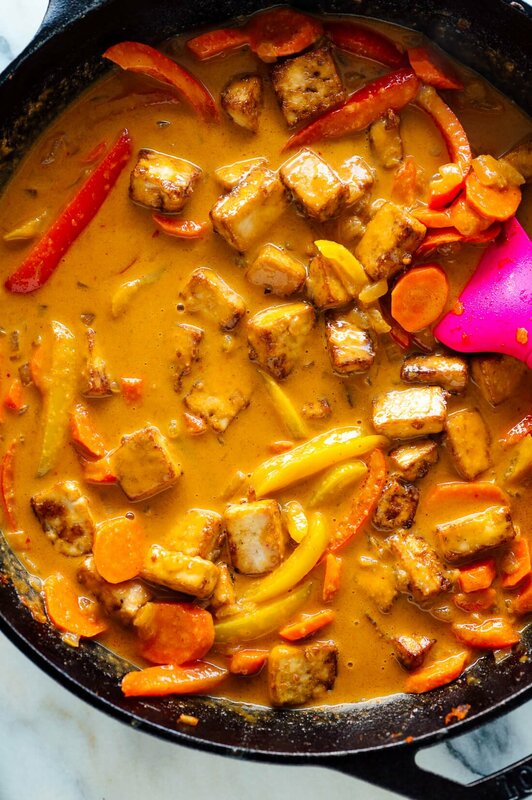 You’ll need panang curry paste to make panang curry! What’s in panang curry paste? Panang curry pastes vary somewhat from brand to brand, but they typically include dried chili peppers, galangal, ginger, lemongrass, kaffir lime zest, kaffir lime leaves, coriander root, coriander seeds, and cumin seeds. You could make your own curry paste if you have those ingredients at home, but I’m betting that you don’t. If you are vegetarian (holler), vegan or have shellfish allergies, you’ll want to find a panang curry paste that doesn’t contain shrimp or fish sauce. I’ve found a couple of great vegan options on Amazon, made by A Taste of Thai and Maesri (those are affiliate links). If I had to pick a favorite, it would be A Taste of Thai. Panang curry paste is a little more difficult to find than standard red or green Thai curries. You might get lucky and find it in the international section of your grocery store, somewhere near the soy sauce. You would definitely find it at an Asian grocery store. You can also buy it online, like I did. I used vegan curry paste (a lot of them contain shrimp). I didn’t add kaffir lime leaves, which are typically simmered in the coconut milk for extra flavor. I couldn’t find them, plus the curry pastes I’ve recommended actually contain this ingredient. I used tofu instead of other proteins (often shrimp or chicken). I used soy sauce instead of fish sauce. Actually, I used tamari, which is a Japanese soy sauce that is typically gluten free (most soy sauces are not). I simply prefer the flavor of tamari. I garnished the dish with regular basil because I couldn’t find Thai basil. I thought it was great that way, but if you can find Thai basil, you might like that even more. If you want to serve tofu with your curry, I’d recommend making that first. You can start on the curry once the tofu is in the oven. Here’s the recipe. If you want to serve rice with your curry, I typed up suggested quantities and how to cook it within the recipe below. 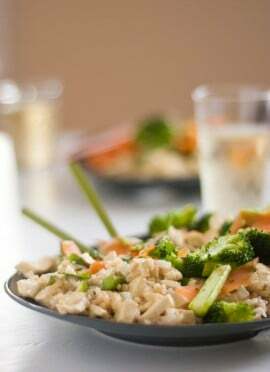 You might also enjoy the curry with cooked noodles or on its own. This curry recipe comes together quickly once you’ve chopped your veggies. 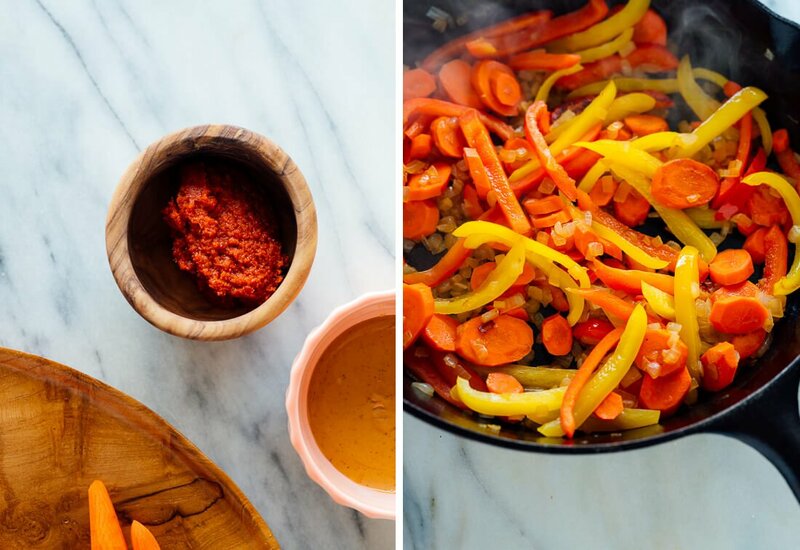 First, you’ll first sauté the onions, peppers and carrots, then add the garlic and curry paste and cook those briefly to enhance their flavors. Then add regular coconut milk (from a can) and some water (so it’s not overwhelmingly rich). At the end of cooking, you’ll stir in some final seasonings: peanut butter (typically found in panang curries), tamari or soy sauce, and a little sugar and lime juice. The interplay of these ingredients create balance and make your final curry taste super delicious. I generally add a little pinch of salt at the end to bring out the curry’s best. That’s it! Garnish with basil (Thai basil if you can find it), and serve it over rice or noodles, if desired. Please let me know how your curry turns out in the comments! I love hearing from you. 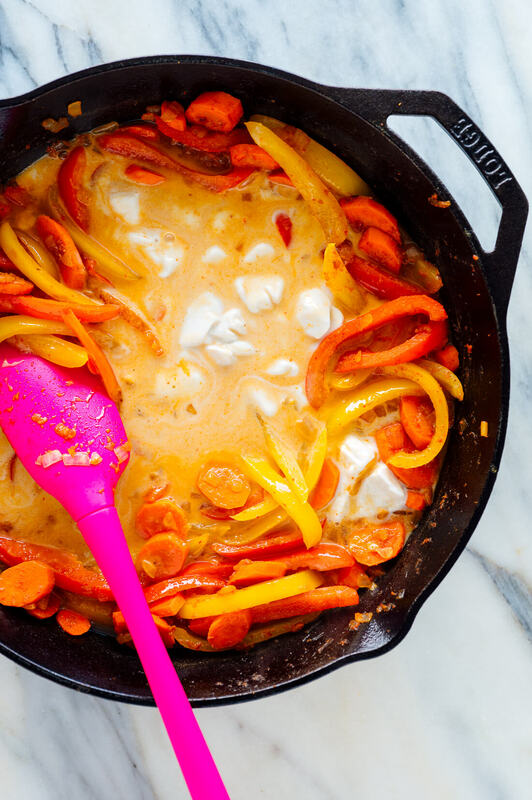 This Thai panang curry recipe is so easy to make at home and tastes better than take-out! This recipe is full of veggies and fresh flavor, and the tofu is optional. Recipe yields 4 servings. If you’d like to serve rice with your curry (optional): Bring a large pot of water to boil. Add the rinsed rice and continue boiling for 30 minutes, reducing heat as necessary to prevent overflow. Remove from heat, drain the rice and return the rice to pot. Cover and let the rice rest for 10 minutes or longer, until you’re ready to serve. Just before serving, season the rice to taste with salt and fluff it with a fork. To make the curry, warm a large skillet with deep sides over medium heat. Once it’s hot, add the oil. Add the onion and a sprinkle of salt and cook, stirring often, until the onion has softened and is turning translucent, about 5 minutes. Add the bell peppers and carrots. Cook until the bell peppers are easily pierced through by a fork, 3 to 5 more minutes, stirring occasionally. Add the garlic and curry paste and cook, while stirring, for 1 minute. Add the coconut milk and water, and stir to combine. Bring the mixture to a simmer over medium heat. Reduce heat as necessary to maintain a gentle simmer and cook until the peppers and carrots have softened to your liking, about 5 to 10 minutes, stirring occasionally. If you’re adding crispy tofu, stir it in now. Remove the pot from the heat. Stir in the peanut butter, tamari, sugar and lime juice. Add salt, to taste (I usually add a pinch or two). If the curry needs a little more punch, add ½ teaspoon more tamari, or for more acidity, add ½ teaspoon more lime juice. 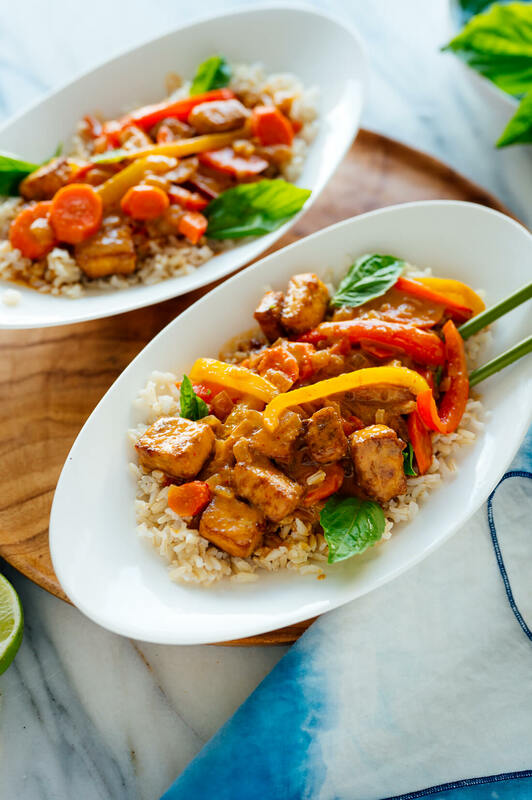 Divide rice and curry into bowls and garnish with fresh basil, if using. If you love spicy curries, serve with sriracha or chili garlic sauce on the side. *Panang curry paste: You might find it in the Asian section of the grocery store. You will definitely find it at Asian grocery stores or you can buy it online like I did. Two brands I like are A Taste of Thai and Maesri, which are both vegan/vegetarian. Not all brands are (they can contain fish sauce and/or shrimp paste). **Make it gluten free: Be sure to use gluten-free tamari instead of regular soy sauce. Double-check your curry paste to make sure it’s gluten free, too. Make it vegan: Make sure your curry paste is free of shellfish and fish sauce. See recommendations provided above. Make it nut free: Omit the peanut butter, and verify that your curry paste is nut free. Thank you Kate … and Cookie! Your recipes are amazing, each one always fresh and full of flavour. Looking forward to making this one tonight. I am putting on 5 stars because I know it will be delicious! I appreciate the confidence, Susan! Thanks for your review. This looks great! What would you recommend that I use to sub the coconut milk? Half and half? That could work, or whole milk. Of course the flavor will vary slightly. 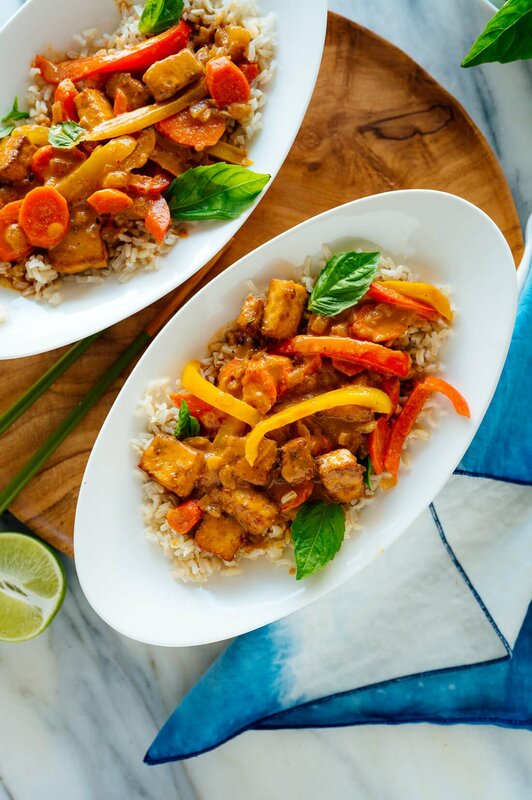 My boyfriend and I LOVE panang curry – it’s our go-to take out order, so when I saw this on your Instagram feed I sent it to him immediately! Can’t wait to try this one too – your Thai Red curry was fantastic and I have a feeling this one will be good too! Hooray! Happy dace! Thanks so much, Margot. Let me know what you think. Looks delicious! 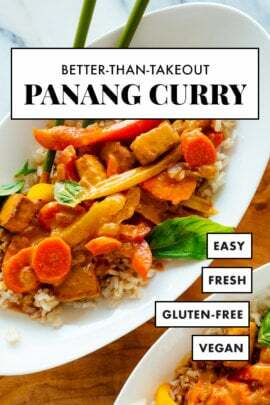 I love panang curry, and this version has way more veggies than my go-to take-out panang curry (good thing!). I’ll keep an eye out for the paste and let you know when I try it! This was amazing. I’ve never made one of your recipes that I didn’t love, and I return to many of them again and again. This will definitely be one of them! Thank you for sharing, Lynne! I made this tonight for dinner. It was like you read my thoughts as always. I had all the ingredients for making the curry from scratch except for subbing kefir lime leaves for lemon zest. To say that it’s a party in the mouth shall be an understatement! I made this tonight with shrimp but can’t wait to try the tofu version for my veggie self. This curry is made for the terrible cold that we are experiencing this week in the NE and beyond. Thank you so much. Wishing you the best for 2019! Party in the mouth, I love it! Thanks for sharing, Pallavi! This looks good but I have a texture problem with tofu. Do you have a suggestion for an alternate vegan protein? It wouldn’t be true to the dish, but maybe try chickpeas if without tofu isn’t enough. I have NEVER seen a more heavenly-looking Panang curry. The tofu looks smoky and satisfying while the curry itself looks vibrant and decadent. EVERYTHING I could ever ask for and more in curry! Looks like peanut butter-y goodness! i have tried several of your recipes and love the ones i have eaten. Thai lettuce wraps leads this list and baked tofu is next. I am very happy that my daughter has turned me on to you. She lives in Kansas as well. thank you for using REAL food. I’m so happy to hear that, Catherine! I appreciate the review. Has anyone tried this with almond butter, not peanut butter? I only have almond on hand. You could try it! Let me know what you think. Of course wouldn’t be as traditional, but should still make a delicious sauce. I’ve only got almond butter too so I’m going to try it. This was ridiculously delicious! I’m always looking for easy, nutritious vegetarian dishes. . .this one will be on my favorites list! I added broccoli and potatoes that I had in the fridge and it was wonderful. Thank you for posting. Enjoyed the recipe and will make again. 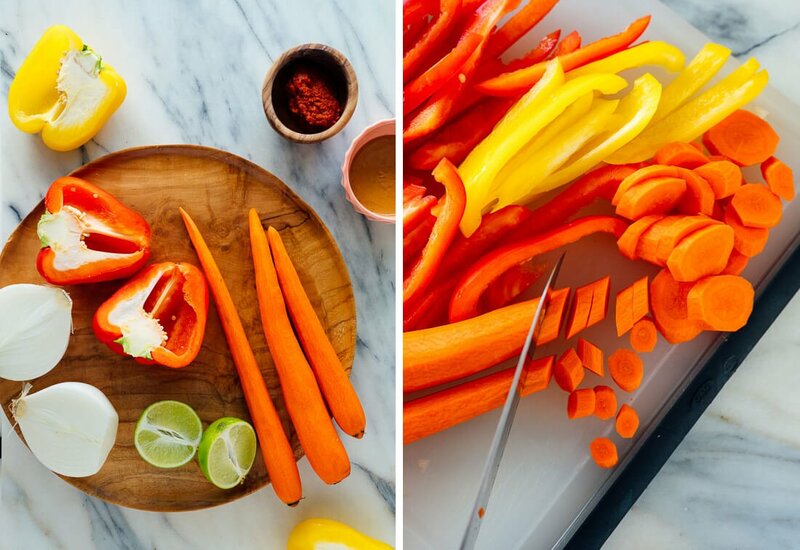 This recipe makes a lot of sauce so will up the amount of carrots next time. I put a lid on while cooking the carrots and the sauce ended up watery so in the future will leave out the1/2cup of water or simmer without covering. The crispy tofu was good! Suggest adding to the dish right at the end or the crispy texture goes away. The thai basil was a new experience: has a strong anise flavor which some did not care for. Regular basil will be used in the future. Very tasty dish! This one is going in my permanent recipe box. This was so quick to put together. I love how you explain a recipe. You explain the ingredients and why they work and how they play together. Also the cooking method is accurately detailed. This all helps to not only recreate your creations but to understand how to play with it and create my own variations. I am a very passionate and experienced cook and can sense the same in you ❤. Try this one, you won’t be disappointed! For those of you who can’t find the right curry, just use regular Thai red curry paste and add kefir lime leaves if you can fine them. I’m so glad this one will be a repeat for you! I appreciate your review. A new favorite — it’s delicious. I made it with ginger, which I threw in at the same time as the carrots, since I had some around and we are fighting colds at my house. I left off adding the bell peppers until just before adding the tofu, since we favor bell peppers crisp. This is a really wonderful dish. Thanks! This recipe I now our new favorite!! Thank you making it so easy! Delish way to enjoy fresh veggies and tofu! This was amazing! So much flavor. And it was even better as leftovers. I’ll be making this one a lot! I’m happy to hear that, Marisa! Thank you for your review. Keep on cooking…I love your recipes! Simple and delicious…thanks for sharing! This is delicious! Tastes like my favorite Panang Curry from a restaurant I love. – Couldn’t find Panang Curry Paste at my local gourmet market so used Red Curry Paste – 2 TBS. I thought it would be spicy but it was not. I need to order some Panang paste! Hooray! I’m so happy to hear that. Thanks for the review, Lauren! Made with crispy baked tofu. Added some baby bok choy at end and topped with crushed peanuts and basil. It was full of flavor and delicious. Thank you! This recipe was amazing. But I’m not surprised. All of your recipes are amazing. The kids and I loved it, so I’m glad I made a double batch. I was cooking a lot on Sunday and ran out of time to make your wonderful crispy tofu. So I used rinsed canned chickpeas instead, and it was delicious! I made this for my family last night for dinner. It was a big hit. I ordered the Panang curry paste online because I couldn’t find it at the store. Other wise followed the recipe. I made the baked tofu as well as some sautéed chicken for the omnivores at our house. Served it all separately and everyone just mixed what they wanted in the bowl. Turned out super yummy and I’m a little sad that there weren’t leftovers for l lunch today! I’m glad you liked it, Kenna! If you would leave a star review since you liked it so much, I would appreciate it! Hooray! I love that, Katie. I’m glad you loved this one too. Dear Kate and Darling Cookie! I made this incredibly delicious recipe tonight with the Taste of Thai vegetarian panang curry paste that you recommended (found it on Amazon). They also sent me a little packet of fresh kaffir leaves so I added them; they smell wonderful. I made your crispy tofu recipe to go with this, which turned out great. I may add less tofu and more veggies next time. I used organic onions, broccoli, carrots and large white mushrooms. I omitted the garlic as it’s often too strong for my digestion (although I love the taste!). Instead of tamari I had Organic Nama Shoyu unpasturized soy sauce which I used for the tofu, so I didn’t add extra to the curry. Garnished with fresh Meyer lemon juice and cilantro as that’s what I had on hand. Organic brown rice complimented the amazing taste and aroma of this dish. I prepared this as a day-late Valentine’s dinner for my husband. A real hit for both of us! Nothing beats homemade! Sounds wonderful, Reva! Thanks for making this and letting me know what you did. Loved this recipe and my guests have already asked me for the receipe! I followed the recipe to a “T” except that I omitted the sugar. Thanks Kate! Love your recipes. I’m excited this one is your favorite. Thanks for the review and feedback, Olga! I didn’t find the panang curry paste in the store, but Target sells a panang curry sauce. It contains the coconut milk already, so I proceeded with the whole container of sauce and skipped adding the coconut milk. It was delicious! Thanks for sharing, Rebecca! I’m happy you were able to make it work with what Target had in store. You can always order it online if you want to try it again! That’s a bummer, but I’m happy you found a recipe that helps to replace it! Thank you for sharing, Erin. If you would like to leave a star review since you loved it, I would appreciate it! Loved it! Used some left over pork tenderloin. Thank you for sharing, Gayle! I’m pretty sure that Maesri curry pastes (the most common brand) are NOT vegan. Nearly all of them, as well as their Nam Prik Pao paste, have shrimp paste (gapi) in them. It is a good brand, unless you are allergic to shellfish or strictly vegetarian. Thai cuisine is not well suited to strict vegetarians, as so many dishes contain a small amount of shrimp paste and/or fish sauce (nam pla). If you can make it without these, well, it’s not really Thai then. Maesri’s panang curry is vegan. I wrote about that within the post. 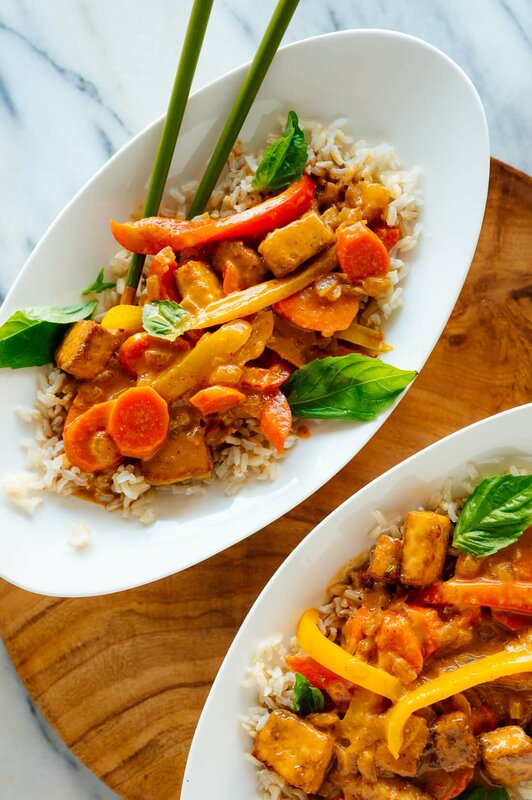 As a vegetarian, I’d hate to miss out on Thai food altogether, so I enjoy coming up with Thai recipes that work for me and those like me. Hope you enjoy! This recipe is SPECTACULAR!! It’s healthy, easy, and captures the flavors of Thai food in a way I haven’t encountered in most recipes. Thank you!